The well-known director of E.T. and Indiana Jones might be having trouble putting his next videogame together. Three years ago, director Steven Spielberg and EA announced a partnership that was to produce three games. The first of those games, Boom Blox, was released on the Wii to favorable reviews, but poor sales. 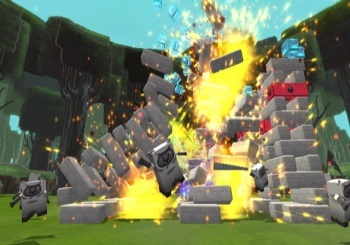 After a follow-up called Boom Blox Bash Party, Spielberg was said to still have a title codenamed LMNO in development, but it's now been confirmed canceled. LMNO may have been in development hell for quite some time, with rumors saying it was scrapped in 2008, but EA insisting it was still working on the title. However, EA told Joystiq today: "While EA maintains its relationship with Steven Spielberg, we ceased development of LMNO." EA didn't say if another title was in the works with Spielberg, but did re-emphasize that it was still working with the director while robotically saying: "EA continually monitors development resources and adjusts resources as appropriate. No new title announcements." Spielberg could be working on the next Boom Blox, or he could have left EA in his expensive car's exhaust fumes years ago. LMNO was once described as a "contemporary action-packed adventure," but few other details were given. The recent confirmation of its death came about due to localization company 8-4's podcast, where former LMNO artist Jake Kazdal explained what happened to it. "I'm sure anybody you ask is gonna tell you something a little bit different, but [LMNO] didn't end up ever taking off," Kazdal said. "There was some rival game stuff that may or may not have come out of EA that was basically the same thing minus some of the stuff we were doing. There was just a lot of politics." If there were politics at work here, I would have liked to see the heated internal arguments with executives and Spielberg angrily using "LMNO" in a sentence. I'm not sure that can be done with a straight face.